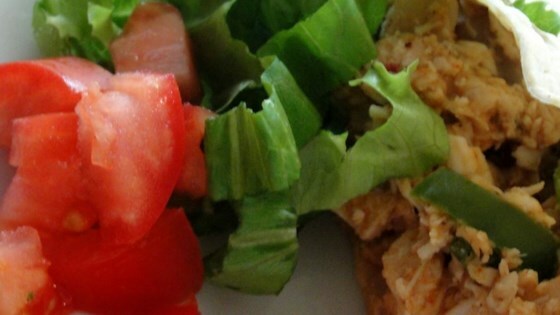 "A fast easy way to prepare chicken for tacos! Great if you fry the tacos too!" Saute onion and bell pepper in a medium skillet until soft. Place chicken breasts on top of saute mixture and spray with cooking spray. Fry chicken with saute mixture until browned and cooked through, cutting or shredding chicken while it cooks. I think you have to cook the chicken first then shred it as the vegetables sauté. This needs seasonings such as cumin, garlic, chili powder, etc. I agree this filling could use some more flavoring and I used a hand blender/food processor to really mince the chicken but it was darn good, I'll probably add many more spices next run through. I liked that the "basics" where there and it was easy but it needed Zing!!! I added in medium salsa, Banana Peppers and that gave it a lift that I was thinking of when I hear the word "taco"
It wasn't awful, but I needed to add seasonings to make the tacos flavorful. This is an OK base but not a complete recipe.